Happy One Year Anniversary AND A Big Announcement! Today marks our one year anniversary. 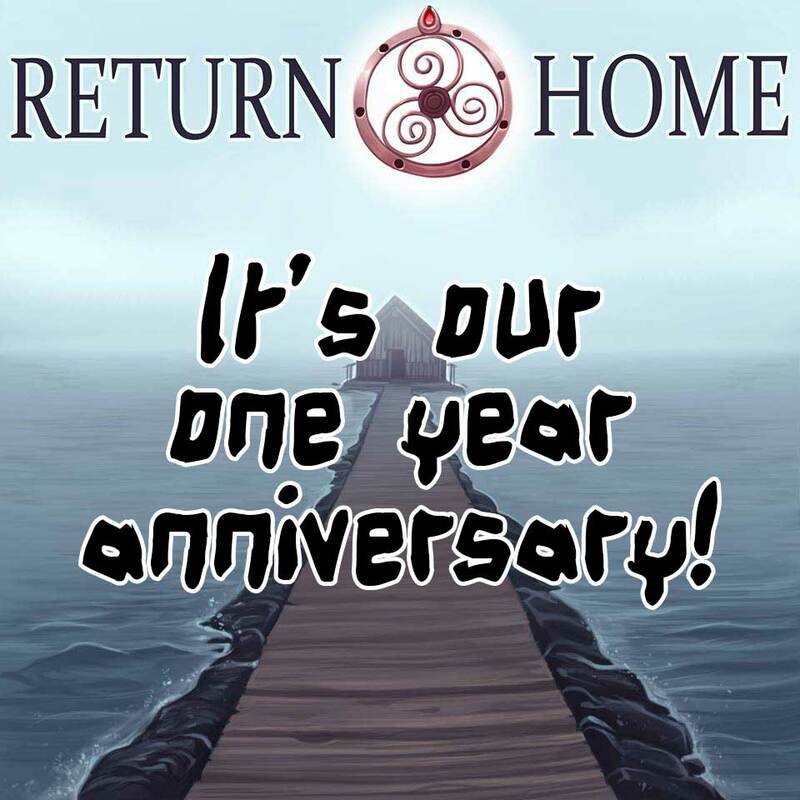 One year ago today, we released the very first episode of Return Home, and what a journey it has been since then. We are floored at how many people have joined us on this crazy journey to Melancholy Falls over the course of the last year. It truly makes our little, black hearts melt to see people enjoy listening to the show as much as we enjoy creating it. We’ve had so much fun telling this story so far, and we cannot wait for you to hear what comes next. From all of us here, we thank you so much for listening along with us. We love you for it. As of right now, we are just over 750,000 downloads, and we are ecstatic to hit that million download mark in a month or so! As a birthday gift to us, if you haven’t already reviewed the show on iTunes, we’d love for you to do so. Help us spread the word of the whispers, and have the show reach more people! Help us get to that million downloads sooner rather than later! And as a birthday gift from us to you…we have an announcement. It’s always been my intention to bring the world of Melancholy Falls to life in other ways, coming out of your earbuds and into the real world. We started doing that just a bit with the ARG last summer. However, we are now taking the next, big step in bringing it to life. Though MSS hasn’t officially announced their programming yet for this year’s convention, we are going to spill the beans on what we have planned: The world of Return Home will be brought to life in an immersive experience that will take place over the entire weekend! What is an immersive experience, you ask? Think of it as a play. However, instead of a normal play, where you sit in the theater and passively watch it happen on stage, an immersive experience makes you a character in the story. You are PART of the show. You will interact with characters, you will be tasked to do certain things, and your actions will affect the outcome of the story. And that’s just it…this isn’t our story. This is YOUR story. You can begin your story at any time, and depending on your actions, your choices, and your answers, your journey will be different from everyone else’s. You may interact with characters that someone else will not. Someone else may be required to do something that you don’t. The choice is yours to make, and it is your story to tell. How will you tell it? Since we are catering to the larger convention audience, the overall story of this experience will be accessible to everyone, even if you’ve never heard the show before. While we aren’t ready to reveal what it is just yet, we can tell you that it will involve two sides of a conflict that you have just barely heard of so far. And, of course, it’s up to you to decide which side you want to join. This one to two hour experience will be free to convention attendees, and will be taking play the entire weekend. This is your notice well ahead of time: come to Midsummer Scream 2017 on July 29 and 30th to be brought into the world of Melancholy Falls in a way you never have before. Located in beautiful Long Beach, CA, the convention is an amazingly good time with tons of fantastic panels and mini-experiences for everyone to enjoy. We had a blast last year, and no doubt will have one again this year. We will have more details on our experience, and convention tickets, soon. But we wanted to give you all a heads up in case you want to attend (and we really want you to! ).